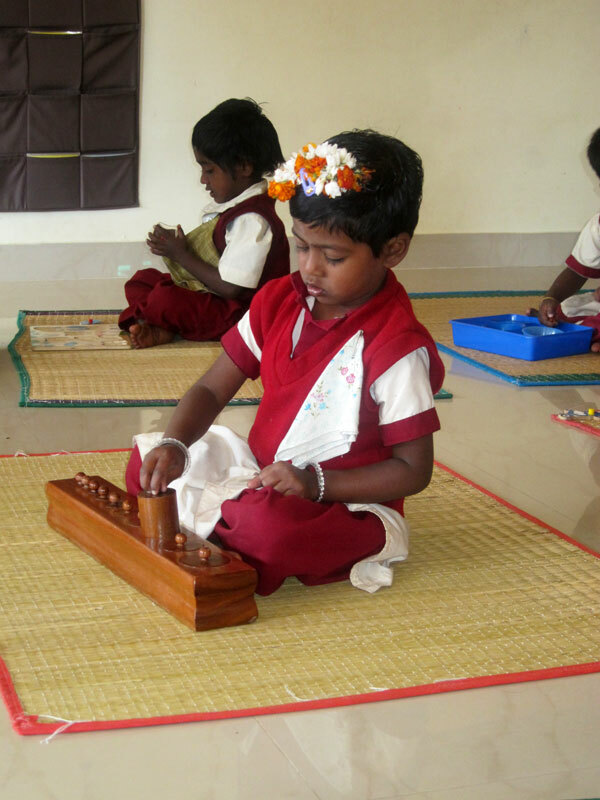 A Montessori preschool for children aged between 21/2 and 6 years was established in 2008/2009 by the Indian priest and Zen master Father AMA Samy. His vision was to give children of poor day labourers and farm workers better starting conditions for admission to a state school. Children from mountain villages and from poor families often have to cope with overcrowded classes, prejudices, authoritarian teachers and rigid discipline. They are discriminated against or are expelled from school if they have learning difficulties and so remain illiterate all their life. Attending a preschool significantly improves the likelihood that these children will successfully stay in the state school system. This then increases their chances of acquiring a good education. According to Maria Montessori, the first six years are the most important in a child’s life. During this period, unconscious learning becomes conscious learning. The Montessori philosophy is characterized by an emphasis on individual learning: own initiative, practical abilities and self-confidence are developed and cooperation and respect taught. The three-storey school building, incorporating five classrooms, a dining hall and a large playground, is located in the centre of Perumalmalai. The children are taken to school by their families at 8.30 am. A school bus or a taxi is getting the children from hill regions to attend the Montessori school. Lessons begin with a short meditation. Individual learning with special Montessori teaching materials is available alternated with time spent together playing games on the playing field or singing. Great value is placed on practising basic rules of hygienic. 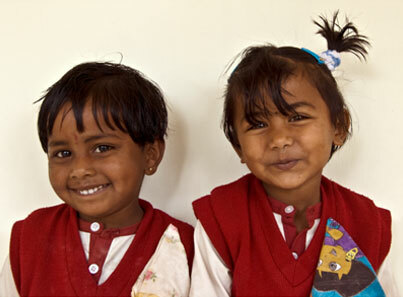 Preschool attendance, meals as well as two school uniforms are free of charge for the children. Parents can voluntarily pay 100 rupees (approx. 2€) per month. Of these 100 rupees, 50 rupees will put into a bank account for each child and repaid to the parents with interest on finishing school. Parents are regularly informed about their children’s development. The school building is also used for private lessons. These are offered to pupils at risk of discontinuing school. Lessons in classic Indian dance are given at the weekends. Importance is also given to food especially for poor children, who often come to school without being adequately fed. Besides a balanced diet, the children get a hearty bowl of porridge for breakfast and at the end of lessons at 4.00 pm a modest meal. Five teachers (educated or at least instructed in Montessori practices), a cook and other auxiliary staff care for the welfare of 105 children. We offer a sponsorship for this project! You can finance a place in our preschool with a donation of 150 Euro. Wages, upkeeping of the building, school material and the daily lunch are financed with this money. This support is not bound to a particular child. You participate in the development of the school and the children by receiving an annual report.